This wonderful, slim, compact gel pen cost me £1.62 from Cult Pens and comes in the following colours; Black, Blue, Red, Green, Orange, Violet, Pink and Sky Blue. I am using the 0.7mm tip model but there is also an Ultra-Fine 0.3mm model. I will have to get my hands on that one soon. The barrel design is what now seems to be the standard clear plastic with a rough grip area to hold the pen whilst writing. With the cap posted, the pen doesn't feel top heavy but nicely balanced. To be honest it feels balanced with no cap posted either. The Pentel Slicci is made from plastic and feels light and durable. It is classed as a Pentel Recycology Pen which basically means it is made from 87% recycled materials by weight. 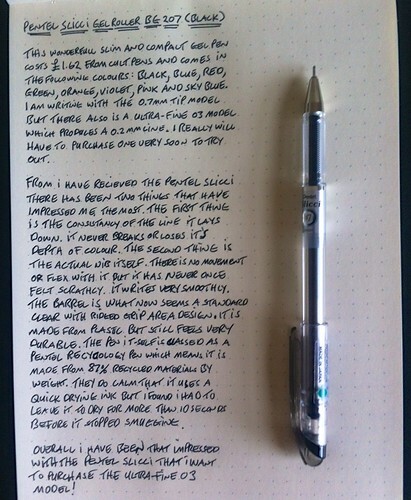 Since I have received the Pentel Slicci, there has been two things that have really impressed me. The first thing is the consistency of not only the ink flow but also the dept of the colour. The line never breaks while retaining a wonderful dark black colour. Secondly is the actual build quality of the nib. There is no flex with the nib but not once did it ever feel scratchy on paper. It writes very smoothly. One interesting point is that Pentel claims it uses a quick drying ink but I found this not always to be the case. I had to leave it roughly 10+ seconds before the ink dried enough that it would not smudge if rubbed. I have been really impressed with the Pentel Slicci as I really didn't know what to expect. Now I really want to try the Ultra-fine 03 model!